Computer-Controlled CMM - Dubuque Stamping & Manufacturing, Inc.
We use CMM (Coordinate Measuring Machine) technology and equipment to ensure the most accurate measurement of product dimensions. This ensures that only parts of the highest quality are released to our customers. Various types of probes are used in CMMs, including mechanical, optical, laser, and white light. Depending on the machine, the probe position may be manually controlled by an operator or it may be computer controlled. CMMs typically specify a probe's position in terms of its displacement from a reference position in a three-dimensional Cartesian coordinate system (i.e., with X,Y, and Z axes). 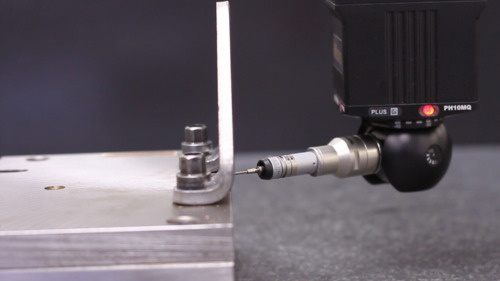 In addition to moving the probe along the X, Y, and Z axes, many machines also allow the probe angle to be controlled to allow measurement of surfaces that would otherwise be unreachable.